It seems that more people than ever before have decided to learn to code. 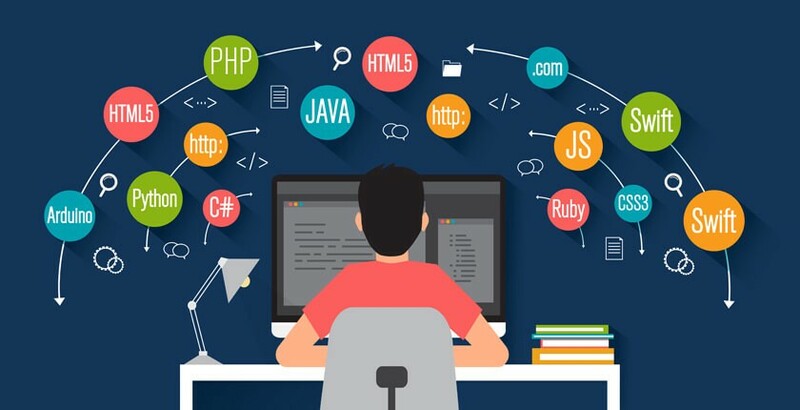 The abundance of high-quality educational materials, tutorials, and mentors on the internet means that self-starters from many different backgrounds can teach themselves programming, whether their goal is to build an app, create a website, solve a particular problem with technology, or become a software developer. Having so many learning resources available is a good thing, but it also presents a problem. When you want to learn to code, where should you start? What do you learn, and what don’t you learn? What’s the best way to practice, and the fastest way to improve your skills? This article aims to help answer some of those questions. As you start to learn how to code and dive deeper into programming, you’ll start to discover more about the specific set of technical skills you’ll need to achieve your goal, whatever it might be. However, when you start, it’s best to start as simply as possible. If you need to build an iOS app, learn Swift. If you’re building an Android app, learn Java. The web framework that is appropriate for you will depend on what you are trying to build. I do think Ruby on Rails is a great option for someone learning to code, as it is very well documented via Rails Guides. The web framework that is appropriate for you will depend on what you are trying to build. If you want to build a game, you should consider learning Unity. If you want to do data science or machine learning, Python plus these libraries are a good choice. A library is some pre-written code that makes it easier to perform particular tasks, such as displaying a scatter-plot. Once you have an idea of what you need to learn, it’s worth giving some thought to a timeline. Your timeline will help to inform the pace at which you need to learn to code. In 3 months time, I want to have published a website for my friend’s band. In 6 months time I want to have launched a working MVP or ‘Minimum Viable Product’ version of my business idea. Even if you don’t have a specific timeline in mind, creating one can help you stay motivated and track your progress against your target. Replace a goal like “I want to quit my job as a librarian and become a software developer”, with something more specific, like “In 12 months, I want to quit my job as a librarian and become a software developer”. Having this timeframe firmly in mind will help you set milestones for your progress. There is no best way to learn to code. Some methods of learning will work extremely well for you, and others will be far less effective. Before you start learning to code, it’s worth understanding how you like to learn and shaping your learning journey around this method. If you’re truly listening to yourself, you will do this naturally. If, however, you feel like there’s a right way to learn, or feel pressured to learn in a certain way, you might find yourself gravitating to learning methods that seem ‘correct’ or impressive but don’t work well for you. Be especially wary of this when being given advice by someone who first learned to code more than a few years ago. These people have the best of intentions, but the methods they used to learn to code might not take into account some of the fantastic resources that have become available over the last few years. For example, back in 2006 when Ruby on Rails was starting to gain popularity, many programmers first learned Ruby by reading a book affectionately known as the ‘Pickaxe Book’, named after the picture of a pickaxe on its cover. An 864 page tome that exhaustively details every aspect of the Ruby programming language, the ‘Pickaxe Book’ is legendary among Ruby programmers. And yet, for someone who is learning code for the first time, it can be very difficult place to start now! When you’re learning to code, it’s easy to sink hours and hours into tutorials that don’t mean very much to you. You might be building toy programs like to-do lists or silly websites for something that doesn’t exist. While this is a good way to learn, it’s not very motivating. Alongside all the tutorials that will have you build something just to learn, it’s incredibly important to build something that matters to you. If you’re learning how to make websites, make a website for yourself, or for someone you care about. If you’re learning to make a web app, practice by building a web app that solves a problem in your own life, no matter how small. If you’re learning to make games, start by creating a game that you yourself want to play. A little anecdote: a few years ago I was a teaching assistant for a class of school teachers who were learning how to code so they could pass the knowledge on to their students. Without fail, the teachers who learned the most in that class were those who practiced by building something for themselves. The teacher who did the best in the class was working to build a simple app to help track her family’s finances. The teachers who didn’t build anything for themselves and only did the in-class exercises learned the least. Something I’ve observed to be true about people is that we’re always the most motivated to learn and retain information when we see it as directly useful to us. Compare the following scenarios: two people are learning how to accept credit card payments on a website. Who do you think will retain this information? The person who is learning because ‘it might be useful some day’, or the person who desperately needs to figure out how to accept donations via their website for the independent documentary they are trying to produce? Having a personal project you care about and can apply your learnings to will be the single biggest thing that accelerates your learning and makes things stick. Whether it’s a mentor or someone else you know who is also learning to code, having someone to support you is invaluable. Learning to code can be challenging, and it helps to know that someone else is going through the same struggles. If you don’t know anyone else who is learning to code, you can try to meet them by attending local tech meetups on Meetup.com. Some meetup groups have ‘Newbie’ nights that attract lots of beginners. If there aren’t local meetups in your area, or meetups just aren’t your thing, a community like CodeNewbie.org is another great place to seek out support. If the idea of learning to code alongside a group of other people sounds great to you, then it may also be worth looking into coding bootcamps. A mentor can also give a huge boost to your efforts to learn to code. They can help you when you get stuck, motivate you when you feel doubtful, advise you on what to learn next, and help you navigate toward your ultimate goal. If you know someone who has already achieved the goal you are working toward (i.e. becoming a software developer, or launching an indie game), then they might be a candidate to mentor you. The truth is, most mentor and mentee relationships don’t start with the question “Will you be my mentor?” They start with an invitation to grab a coffee, a meal, or a beer, and continue after that if it works for both of you. You may not be lucky enough to already know someone who can be your mentor. If not, that’s why services like CodeMentor exist; to connect you with a mentor who can help you on your journey to learn to code. It’s much better to practice regularly for 20 minutes each day than to do three hours once a fortnight. Consistency will help you to solidify what you learn and retain information. If the gaps between practice sessions are too long, you’ll forget things and lose the ability to do things that you had previously committed to muscle memory. Learning to code can be a long journey, and it can be easy to forget how far you’ve come. Even after you’ve learned the fundamentals of programming, which is a fantastic achievement, it can still feel like there is so much you don’t know. That’s why it’s important to track your progress and reflect on what you’ve learned. Every day, or every week, write a paragraph about what you learned that you didn’t know the day or week before. After a while, marking your progress with these little journal entries will help you appreciate how far you’ve come. One thing that can slow down your progress when learning to code is never finishing things. After all, starting projects is fun! You get to pick and choose the parts you want to build, and the things you want to learn. If something is too hard, you leave it until later… but what if later never comes? You end up not getting enough practice by putting off challenging tasks until later. If you get into the habit of not finishing things, this can lead to gaps in your knowledge. Remember: it’s better to finish just one thing than it is to start ten things and never finishing any. One thing that goes hand-in-hand with learning to code are error messages! They’re those scary red screens and noisy pop-up boxes that tells us we’ve done something wrong in our code. When we see one of these, our first instinct is usually to navigate away from the error message as quickly as possible and start looking for a solution. But did we actually take the time to read it? If not, we might be missing out on a lot of helpful information. In fact, error messages can be awesome, because a lot of the time they tell us exactly what is wrong, and where. In fact, the worst thing we can do when we encounter an error message is to navigate away from it without reading it properly. So remember: error messages are your friend. They’re there to help you, not to punish you. One of the best and yet the most challenging things about technology is that you can never learn it all. In fact, the more you know, the more you realize that you don’t know! There are thousands of programming languages, web frameworks, tools, specifications, libraries, and protocols you could possibly learn about, but it would be a mistake to try to learn them all. Try not to go down rabbit holes. List the things you need to learn to achieve your goal, and try to stick to those until you achieve it. As you discover things you want to learn about along the way, write them down in a safe place and return to them when the time is right. So much of being a good programmer is simply not getting side-tracked. You can start developing these skills now, even in the very early days of your coding journey. And remember, there’s no script for this! There are a thousand different ways to learn to code. Some people pick up programming extremely quickly, while others take longer. One person might quickly grasp concepts that you find difficult, while another might struggle with something that you think is easy. Your journey might not be linear. You may take breaks, get side-tracked, or have doubts. You might learn to code, then forget, then learn it all over again. The last thought that I want to leave you with is that there’s no right way to learn to code, and no blueprint that works for everyone. Learning to code is a journey that will be as unique as you are. Embrace the uncertainty, and go for it regardless. It’s truly worth it. Append Score is a platform for innovation, product design, product mockups, product innovation, apps, and the latest scripts, where make designers, thinkers and entrepreneurs all meet in the middle.